Wangi Lai PLT co-founders Daniel Vong (second right) and Joel Vong (right) accept their prize from Selangor State Senior Executive Councilor Dato Teng Chang Kim, while Sitec CEO Yong Kai Ping (left) looks on. 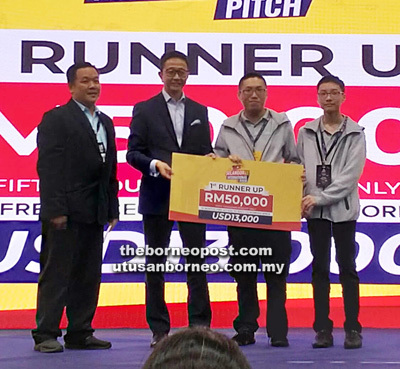 KUCHING: Wangi Lai PLT, a Sarawak-grown IoT startup, placed second between two Taiwan-based startups at the recent Selangor International Pitch competition. Held at the Malaysia International Trade and Exhibition Centre (Mitec), the Selangor International Pitch was part of the Selangor Smart City & Digital Economy Convention 2018 which was co-organised by the Selangor Information Technology and E-Commerce Council (Sitec), Menteri Besar Incorporated Selangor (MBI), Smart Selangor Delivery Unit (SSDU) and Invest Selangor Berhad. Wangi Lai PLT competed by pitching to a panel of judges against a highly competitive lineup of 29 other top startups from the Asia-Pacific region such as Taiwan, Korea, China, Indonesia, Thailand, Singapore as well as Malaysia. Their innovation, BAWA Cane – a clip-on IoT device for white canes to help and empower the visually-impaired to better perceive their environment – wowed the judges. The BAWA Cane (www.bawa.tech) helps users with mobility and navigation by using an IoT sensor to improve obstacle detection and avoidance, giving foresight of the surrounding environment through Big Data Analytics. This information is then transmitted to a cloud server and then to the user via audio, allowing them to navigate safely around. BAWA Cane is available on Indiegogo during the campaign period at https://igg.me/at/getbawacane. “We are proud and grateful to be one of the winners of the 2018 Selangor lnternational Pitch. This will go a long way in helping us take the necessary steps to empower millions with technologies that may change their mobility and access to get what they want to achieve,” said Daniel Vong, co-founder of Wangi Lai PLT. Wangi Lai PLT is one of the winners of the inaugural TEGAS Pre-Accelerator Bootcamp – a two-week boot camp designed to kick-start early-stage startups from having validated ideas into creating a minimum viable product (MVP) and a go-to-market strategy. Wangi Lai PLT has also been invited to speak at Naidex, Europe’s largest and most established event for the disability sector, on March 26 and 27 next year in Birmingham, UK.